This, and others like it sprung up around Detroit earlier last week as Suh approached NFL free-agency. Not sure what they are trying to say. By spelling his name with a dollar sign, are they trying to intimate that he values money more than loyalty? I do not remember the Lions attempting to re-sign him or slap him with the franchise tag, and yet where is the outrage over dropping Reggie Bu$h to save $$$ – so where is the loyalty in that Detroit Fan? If you believed that Detroit mismanaged this process two years ago, you can not fault Ndamukong Suh for leaving. Word is, Suh has agreed in principle to take his talents to South Beach for $60m guaranteed. That’s 6yrs @ $114m! That’s QB money!!! Florida has no state income tax! 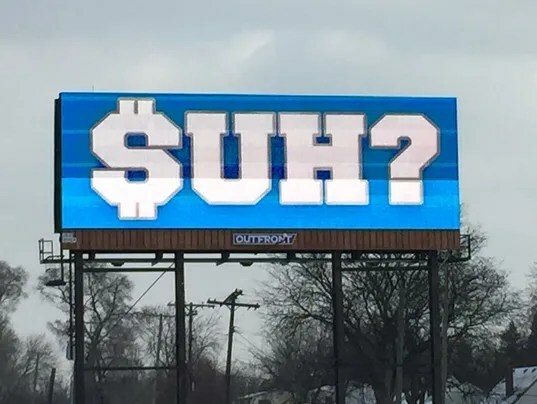 We should all have Suh’s agent because if this contract is real, then it means that after the $40m guaranteed he got on his first contract – that totals a $100m guaranteed, in two contracts! That’s baseball money and for a position that does not dominate the outcome of games played. Ndamukong Suh is a good football player, but what games do you remember him dominating like he did at Nebraska? Any idea on the Greatest DT of all time? Any names jump out? I’m not talking about guys that played inside and out, because Suh does not. He does not play D-end because he is not fast enough, nor does he have the technique – let alone deserve JJ Watt money. That’s the point tho – He is being paid like JJ Watt. Do you remember Suh scoring touchdowns or making plays that had his name in MVP conversations? The Dolphins made a splash that swims well with the fans, but this contract is going to end up as a financial noose, because Suh is more Haynesworth than Watt. $uh is good, not great and in no way relevant to a team’s overall success – he is the 5th cheese in the 6-cheese pizza. So to those that spent all that scratch on those billboards, be thankful. Because here is a list of defensive players better than Suh, that deserved a $100m – notice how many played inside and out! It has been a frenzied week for the NFL and potential free agents. Peyton restructures, Marques Colston restructures, Jarius Byrd restructures, all so the Saints could resign Mark Ingram – 6 decent games his entire career and the Saints make him the priority and talk of trading Curtis Lofton – the only linebacker we’ve had since Vilma Fett! Arm-chair general managing is the new normal and you have to wonder if more “actual” GM’s just need to sit back, pour a drink, eat some cherry nibs and cheetos – because there is no way Ingram over Lofton makes any sense. Our defense isn’t good enough to want too mirror the Falcons. But what also happened is there is a lot of movement, or rumors of movement, as usual this time of year. Remember when Eagles fans went bonkers for signing CB Ngamdi Asou…Asug…Awsumwah…whatever his name was – and Vince Young (making a comeback because he’s broke) proclaimed the Eagles as the best team and winning the Superbowl. Im not sure about you, but I remember Ngamdi leaving more WR’s open than a 5yr old does the front door. So we have Reggie Wayne being the last Manning-Colt to turn the lights off on that chapter and hopefully getting another chance to contend. Jeremy Maclin is rumored to be headed to the Chiefs – guess he’s used to dead-armed QB’s throwing him the ball and I’ll guarantee right now, he will score more touchdowns than all the 2014 Chiefs WR’s combined!!! Randall Cobb is supposed to come back to the Pack. LeSean might actually sign a contract extension to STAY in Buffalo – prompting us to look back at the end of that extension with thoughts of: “remember when Shady was….” Of course Darrelle Revis is considering the offer from the Chiefs, because he won his ring and can get paid – plus, look who the QB’s are in that division – its about legacy – and the money – it’s really about the money – Revis Island has a high standard of living. 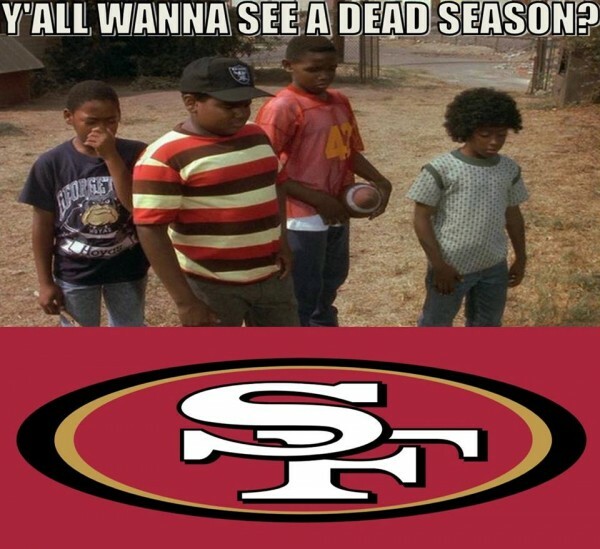 San Francisco, we take the time to remember your past accomplishments back in the 80’s and early ’90’s. Guided by the Legendary Bill Walsh you won Superbowls, you had iconic games and players. Then after the George Seifert experiment, you had Steve Mariucci and then….um…..some other guys. At one point, you had some ginger QB that ran around and threw the ball. I’m not sure but there’s a fuzzy period in there where you guys weren’t very good. You then hired Jim Harbaugh and became closer to your famed past glory (3 back-to-back-to-back NFC Championship games) – but hubris or arrogance allowed you to remove the coach responsible for that resurgence. Well now you can relive those fuzzy/hazy-san francisco-bay-kinda days again with coach what’s-his-name: featuring players like – that guy, and some other dude. The heart of the team, Frank Gore is leaving for Philly. Management signed Jerome Simpson – seriously, Jerome Simpson. Patrick Willis would rather retire and you are shopping for trade partners to take Xerxes – one simply does not trade for Xerxes, Xerxes trades you. Leaving coach what’s-his-name with so much talent that you’ll contend for a top 10 draft pick for the next five years. 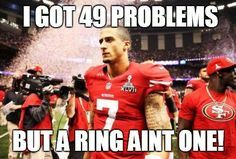 the Forty-Whiners are going to be looking across the bay at Oakland (while they’re still there) with envy. Fans will wish they were Raiders fans – solidifying the region as the most cross-dressing fan base in the country. Seeing this house burn down makes you thankful that the worst thing your team has done is resign Mark Ingram and “consider” trading Lofton for cap room. Every fan that used to share a division with those clowns-by-the-bay are smiling. Are the Raptors falling off or is Westbrook having a legen…wait for it…dary stretch of games. It could be both, and for Russell Westbrook securing his 5th triple-double in 6 games – this time by the 3rd quarter, has you thankful the season is so entertaining. Just look at the MVP race with 4 worthy candidates: Steph Curry, Westbrook, Harden (with his own triple-double Friday night against Detroit) and Lebron – with Lebron the least likely to win, for validation on the kind of season we are witnessing down the stretch. For perspective Oscar Robertson averaged a triple-double for an entire season in ’61-’62, for the Cincinnati Royals – averaging 30.8pts, 12.5 rebounds, and 11.4 assists – also setting the mark for most triple-doubles in a season with 41. Wilt Chamberlain recorded the only double-triple-double – 22pts, 25 rebounds and 21 assists. With all the attention on how well Westbrook is playing right now – keeping the Thunder ahead of the Pelicans for the 8th seed – you wonder if it makes sense for Durant to hurry back. Considering his recent string of injuries and their frequency, is it better to make him sit instead of the risk versus the reward of the 8th seed? Check the RotoCanon page for the today’s DiRTy Plays!